Adsense screenshots are simply screenshots of the adsense revenue from a site. Usually done using the PrintScreen button on the keyboard. They are presented to site buyers by the sellers as proof of revenue. Screenshots are an integral part of any site sale and knowing how to produce proper adsense screenshots when selling your sites is essential for a successful and profitable sale, as it increases buyer confidence in the site and provides buyers more details. Almost every time I buy a site I’m forced to ask the seller to provide a proper adsense screenshot. Most first time sellers seem to think that just showing some random numbers is good enough. Many make screenshots of their entire account, including other sites which are not included in the sale. Some produce screenshots so small that look like they were made on a Nokia 3110, so no numbers can be visible. Others yet cut out everything and only leave several revenue numbers with no dates, urls or other details. Proper adsense screenshots should be done using the ‘URL channels’ or ‘Sites’ option in the reporting tab. The should clearly display the url of the site the screenshot is done for and the monthly revenues (or daily if the site is less than 2 months old), as well the graph showing daily revenues chart. You should also block out sensitive data as per Google tos: it’s common to leave only the pageviews and estimated earnings columns and block out all other columns and numbers for: Clicks, CTR, CPC, Page RPM. You can also block part of your publisher id (although it doesn’t help much as your publisher id is displayed in the code of your site with the ads, so you should leave at least a part of it so sellers can check to confirm that they match) and it’s common to block out the email on the top right corner, or at least part of the email. 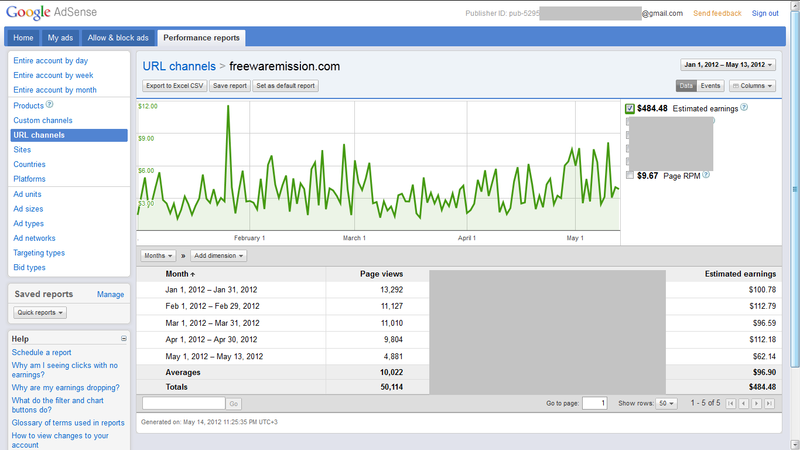 Login to your adsense account and click on the Perfomance Reports tab. On the left corner right below the chart click on where it says ‘Days’ and pick ‘Months’ instead – or if your site is new, less than 2 months old then leave it with days. Open ‘Paint’ in windows (or a similar program in Mac/Linux) and press Ctrl+V to paste the screenshot you just made into a new file. Then save it as a jpg image. Make several screenshots: one for the entire duration of the adsense earnings on that site and another one for last 30 days or last 3 months. Now your perfect adsense screenshot is ready, email it to your buyer or upload it to your site. It’s best not to use free image hosting because you’d usually want to remove the screenshot later and not all image hosting sites let you do that. Remember that screenshots can easily be faked. While few people would actually do it, there are plenty of scammers out there. So do your own due diligence and use several other sources of information to cross check the data and stats, such as Semrush, Compete and Alexa. For more info on selling a site check out this extensive guide for sellers, or contact me for a quote. I think the step by step method of how to make a proper adsense screenshot is quite helpful. Thanks for sharing the information on how to take proper adsense screenshots. I am using adsense in my blog for past 5 years and it is doing really well. I had created a new blog for my business about 7 months ago and I am posting on it regularly but whenever I apply for adsense, it shows that I should increase the content. I already have more than 200 pages on the site. What may the possible problem be?